1) Kings Bowl Dedham, James White, Boston Medical Center, and Blue Sky Sports & Entertainment invite guests to join them for a charitable evening of food, fun, and bowling. Grab your bowling shoes and balls - Sitters Without Borders will be holding a bowling party and benefit on Wednesday, September 5, from 6:30pm-8:30pm, at Kings Dining & Entertainment in Back Bay. This is the perfect time to grab your friends and have fun while helping to support advancing mothers into economic independence. Sitters Without Borders, Inc. ("SWOB") is a first of its kind non-profit organization that offers free to low-cost weekly babysitting services to low-income mothers attending college in the Greater Boston area. SWOB volunteer sitters are committed to assisting mothers with childcare responsibilities, allowing them to pursue higher education and elevate their economic position. 2) A new feast is hitting the streets of the North End this September to wrap up feast season- the Feast of San Gennaro! Taking place from Friday, September 21st through Sunday, the 23rd, the feast will feature a plethora of Italian food vendors, entertainment, and live music from The Jersey Boys, Sal “The Voice” Valentinetti, and the New York Bee Gees. The venue will be on the last block of Hanover Street (near Commercial St.) and Battery Street, similar to the site for the St. Agrippina’s Feast and Madonna Della Cava Feast. In addition to the Feast of San Gennaro, September feast revelers and saint devotees can also enjoy a North End procession for Saint Rosalia di Palermo on September 9th and a procession and Mass honoring St. Padre Pio on the last day of the Saint Gennaro feast, Sunday, September 23rd. I've long had a special place in my heart for the wines of Portugal, constantly recommending them to family, friends and my readers. And of course I've also enjoyed the cuisine of Portugal, from the hearty Francesinha sandwich to Lapas Grelhada, grilled limpets. However, I've not yet traveled to Portugal, though hopefully that will change in the near future. So, for the time, I must live vicariously through others who have traveled to or live in Portugal, to teach me more about this fascinating country. Gabriella and Ryan Opaz, who live in Porto, are the founders of Catavino, which began as a wine blog dedicated to Spanish wine and has since evolved into a boutique travel agency, focusing on the food and wine of Portugal and Spain. Gabriella is also a speaker, writer and consultant while Ryan is also a photographer and writer. Sonia Andersson Nolasco, who works for Catavino, is a journalist, editor, and publicist, primarily working with food, wine, travel and art in the promotion of Portugal. 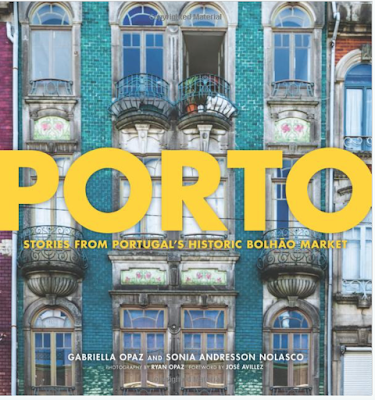 Porto: Stories From Portugal's Historic Bolhão Market is a culinary journey through Northern Portugal, with a concentration on the historic Bolhão Market. The market was designed in 1914 although the area had previously been an open air courtyard where diverse goods were sold. goods. The term "Bolhão" means "big bubble," a reference to a spring that allegedly runs under the market. The market once had over 400 vendors but that decreased to less than 100, partially due to the deterioration of the buildings over time. The market is currently closed, undergoing an extensive renovation which is supposed to be completed around July 2020. The vendors have been temporarily relocated during the renovations, though some have chosen to either move on or retire. Because of these renovations and relocations, it is especially timely for the release of this book. The authors have been able share the stories of numerous long-term vendors, preserving their compelling stories. These are tales and histories that might have otherwise been lost, and that truly would have been a great loss to the culinary landscape of northern Portugal. In some respects, this book is a culinary time capsule, preserving fascinating stories for future generations. Hopefully too, it will act as inspiration for other food markets, including the renovated Bolhão once it reopens. The book is broken down into seven Chapters, each dedicated to a food group, including Bread; Fruits & Vegetables; Fish & Seafood; Poultry; Meat; Cured Meat; and Pastries & Coffee. Each chapter describes various Portuguese foods, dishes and ingredients, including some of their intriguing history. In addition, there are descriptions and stories of the various cooks and vendors from the Bolhão Market that specialize in these items. Spread throughout the various chapters, you'll also find recommendations for restaurants and food shops in northern Portugal. There are also 11 different recipes, from Arroz De Pato A Antiga (Old-Fashioned Duck Rice) to Sapateira Recheada (stuffed stone crab). Each chapter is loaded with interesting and valuable information. Throughout the book, there is a strong emphasis on the women of Bolhão, though men feature prominently in the Meat chapter, and this is partially due to the fact that approximately 75%, if not more, of the vendors are women. And their stories are fascinating, especially those who have worked at the market for many years. They are culinary experts in their chosen field, dispensing their experience and knowledge to their many customers. You can be confident in their products, feeling their passion. These are human stories, worthy of your attention, and which will touch your heart and soul. Each chapter will stimulate your appetite as you read the delectable descriptions of Portuguese foods, from Açorda à Alentejana (a bread-based stew) to the famed Pastel de Nata (egg custard tarts). The diversity of Portuguese cuisine is made clear, and you'll find plenty of interest. This is a compelling guide to the culinary treats of northern Portugal and may lure you to visit the country. The various recommendations, for restaurants and food shops, within the book would also help your travel plans. As a history lover, I was also entranced by the historical information found within each chapter, such as the origins of certain foods. You'll learn plenty within those pages. The book is an easy and compelling read, well written with a certain poetry to the language, indicative of the passion of the authors. This is not some dry travelogue but rather a seductive lure intended to convert you into a culinary lover of northern Portugal. It will work well as a reference guide as well, something to turn to from time to time to better understand Portuguese food. And the compelling stories of Bolhão Market are inspirational. Ryan's photography well complements the writing, with numerous, alluring photos of various foods and great portraits of numerous vendors. There is a sense of joy in the various vendors which Ryan has well captured. Overall, I highly recommend this love letter to the cuisine of northern Portugal, as exemplified through the Bolhão Market. Informative and fun, tantalizing and seductive, inspirational and touching, Porto: Stories From Portugal's Historic Bolhão Market belongs on the book shelf of any food lover. Gabriella, Sonia, and Ryan have put together a fascinating book well worthy of your attention. I am now even more interested in traveling to Portugal, to experience all that country has to offer. I want to eat and drink my way through northern Portugal, and with this book, I have a blueprint of Portugal's culinary treasures. Labor Day weekend nears and for many, this is a signal of the end of summer. As such, you'll stop seeing media advertisements for Rosé wine. Wine distributors will generally stop recommending Rosé to their accounts. Many wine shops will stop carrying Rosé until the springtime. This is all part and parcel of the myth that Rosé is a "summer wine." The reality is that Rosé can and should be consumed year-round, no matter what the season. It's interesting that many of the individuals responsible for promoting this Rosé myth actually know better. They understand the truth, that there is absolutely no reason you should stop drinking Rosé just because fall arrives. Rosé is appropriate year-round, especially because it pairs so well with a diverse selection of foods. For example, it works very well with Thanksgiving dinner. If you can drink white wine in the fall and winter, there is absolutely no reason you cannot drink Rosé too. I drink Rosé all year round and strongly encourage everyone else to do so as well. The situation has slowly improved during the last several years but significant change is still needed. There are some wine stores which stock Rosé throughout the year and if your local shop doesn't, then you should recommend that they stock some. And if they don't bring in some Rosé, then seek elsewhere for this wine. Share some Rosé this fall and winter with your friends, showing them the potential of this delicious wine. Don't ask if they want Rosé but just pour them a glass. Once they taste the wine, they'll probably come to the realization of what they have been missing. We also need more wine writers to pen Rosé articles during the fall and winter, to persuade consumers that this pink wine is appropriate during every season, and not just during the summer. Raising consumer awareness is vital to spreading a passion for Rosé year round. We need to correct their vinous myth. Drink more Rosé, now and throughout the fall, winter and spring. 1) Post 390 is pulling out all the stops beginning with a special summer Après Beach Party, inspired by the latest menu, on Thursday, August 30 in Post 390’s Tavern from 4:30PM – 8:00PM. The festivities include fun swag, summer games such as corn hole, passed appetizers specially inspired by the new Après Beach menu, and refreshing libations. Guests are welcomed to stop by and check out all the fun at Back Bay’s dining destination. 2) On Monday, September 10th, Kings Bowl Dedham, along with New England Patriots Running Back James White, Boston Medical Center, and Blue Sky Sports & Entertainment, will be hosting the 9th annual Sweet Feet for Strikes fundraiser, formerly the Mayo Bowl, to benefit the Boston Medical Center. As the largest professional athlete-attended event in New England, the tournament attracts over 400 attendees and high-profile sports celebrities annually, including many past and present New England Patriots. In 2017, Sweet Feet for Strikes raised over $400,000- contributing to the $2.3 million it has raised since it’s 2010 inaugural event to fund medical care at Boston Medical Center for Boston’s inner-city youth. A limited number of GA tickets are available for purchase here: www.sweetfeetforstrikes.com. Sponsorship opportunities are also available. All guests must be 21+. Bivalve specialties will be available for the duration of the Oyster Festival and include Fried Oysters (three for $10) in four preparations (buffalo, BBQ, sriracha lime and BLT); Baked Oysters (three for $12) available in a quartet of options (lobster spinach, crab & cheese, scampi and roasted); and the Legal Sea Foods teams will shuck seasonal standouts at their raw bars daily for those who opt to go au natural. Legals also suggests washing it down with the official drink of the 2018 Oyster Festival, the Deadrise, with Tito’s Handmade Vodka, muddled cucumber, lime and grapefruit bitters ($11). What is it about the pizza joints in Malden? I previously wrote about Classic Pizza, a typical pizza & sub restaurant but which also has a small, delicious and intriguing menu of Indian cuisine. You would never know from the outside that you would find inside tasty Chicken Tikka Masala or Paneer Pakora. Now, I've stumbled on another typical pizza and sub joint, Jay's Pizza & Ice Cream, which also is hiding a fascinating speciality. Jay's is a tiny spot, with only a handful of tables and seats, but has a lengthy menu of the usual suspects, from pizza to subs, chicken fingers to calzones. However, you'll also note a small sign advertising Jhol Momos, a Nepalese dish. Who would ever have suspected this pizza joint would sell Nepalese dumplings? Maybe this is due to the recent change in ownership. Momos are indigenous to South Asia, especially Tibet, Nepal, parts of India, and Bhutan, though the word itself seems to have Chinese origin, and simply means "steamed bun." They can be filled with a variety of ingredients, from yak to pork, chicken to vegetarian. 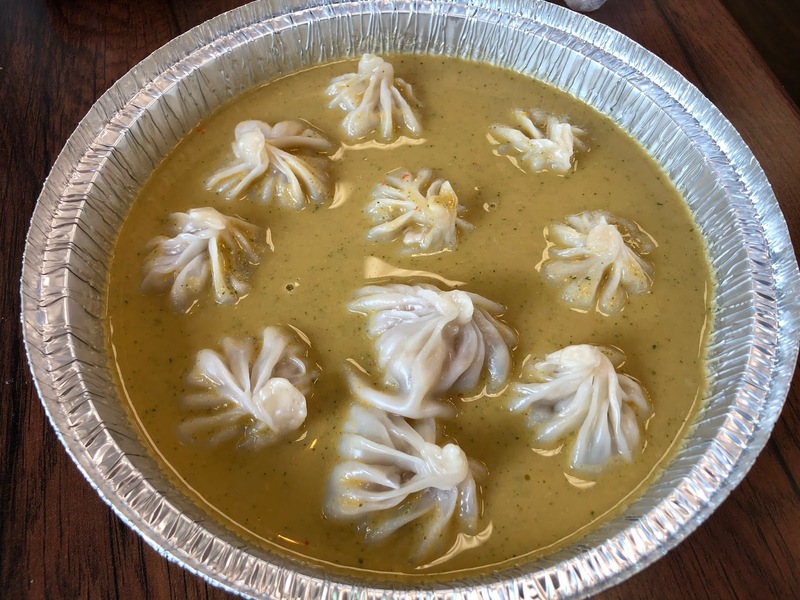 Now, you can find momos in at least a few restaurants in the Boston area but Jay's offers a type of momo which is much less commonly found in the local area. In Nepal, especially its capital Kathmandu, jhol momo are an extremely popular street food. "Jhol" roughly translates as "liquid" or a "liquid-like consistency," and the dish itself are momos in a cold broth. The broth may include ingredients such as sesame, garlic, tomato, onion, lemons and achar (an Indian condiment of pickled fruits and vegetables with spices). It may taste hot, spicy, sour and/or tangy, dependent on the specific ingredients and their ratios. At Jay's, the Jhol Momo dish costs about $8-$9 and you receive 10 hot Momos in a cold broth. The dichotomy between the hot and cold was initially a little jarring, as it isn't a usual combination you find in many cuisines. You might get a room temperature sauce for other dumplings, but it is almost never a cold sauce. And even then, you can add as much or as little of the sauce you desire. In this case, the momos are sitting in the cold broth. However, after the initial trepidation, I found that the combination actually worked well. The momos themselves possessed a fairly thin dumpling wrapper that had just the right amount of consistency, and they were filled with an ample portion of a tasty pork and spice mixture. You can also opt for chicken or vegetation momos. On their own, the momos make an excellent dumpling. Now, the cold broth was intriguing, with a strong and complex curry taste, and it added to the flavor of the momos. The broth seemed to have lowered the temperature of the momos, transforming the hot dumplings into a dish that worked well on a hot summer day. Highly recommended. So what other Malden pizza joints are concealing special culinary treasures? "Wine is, at its best, an agent of beauty, and the writer does well to engage with it on that level." I've begun reading an advance copy of Terry Theise's new book, which is due out in November. The Introduction, which many people commonly skip when reading a book, is a fascinating read, full of intriguing ideas and poetic language. The above quote is in the introduction, and I suspect it will be elaborated further within the book. However, it is a concept which Theise touched on in his prior book, and which others have advanced as well. The quote brought to mind one of my old posts too, which dealt with beauty, and I felt it was warranted to bring it back as the ideas are timeless and worthy of reflection. What are your thoughts on beauty and wine? 1) National Clear Out The Shelters Day, a unified campaign dedicated to helping families bring home a furry friend, will soon be here and Harvard Gardens wants your help. Join the Beacon Hill bar on Saturday, August 18, from 11ma-3pm, for specialty cocktails, food specials, and raffles, all in the name of a cause you can feel good about. All proceeds from the raffles will be donated to cover adoption fees at local shelters for dogs and cats in need of a loving home. Some prizes will include: a class pass to Soul Cycle, jewelry from Crush Boutique, something sweet from Beacon Hill Chocolates, an assortment of gift cards to local restaurants, and more! Every year millions of companion animals end up in shelters, and that number continues to rise. According to the American Society for the Prevention of Cruelty to Animals, about 1.5 million dogs and cats combined, are euthanized due to overcrowding. This number can be reduced dramatically if more people adopted pets instead of buying them. So stop by Harvard Gardens next Saturday to help these animals find a home! 2) During the month of September, Kendall Square’s Sumiao Hunan Kitchen will be shaking up its specialty Mai Tai cocktail for only $5. Sumiao’s Hunan-style Mai Tai is an interpretation of the spirit-forward worldwide classic, paying homage to the original cocktail recipe from Trader Vic Bergeron but with subtle changes to complement its signature Hunan cuisine. 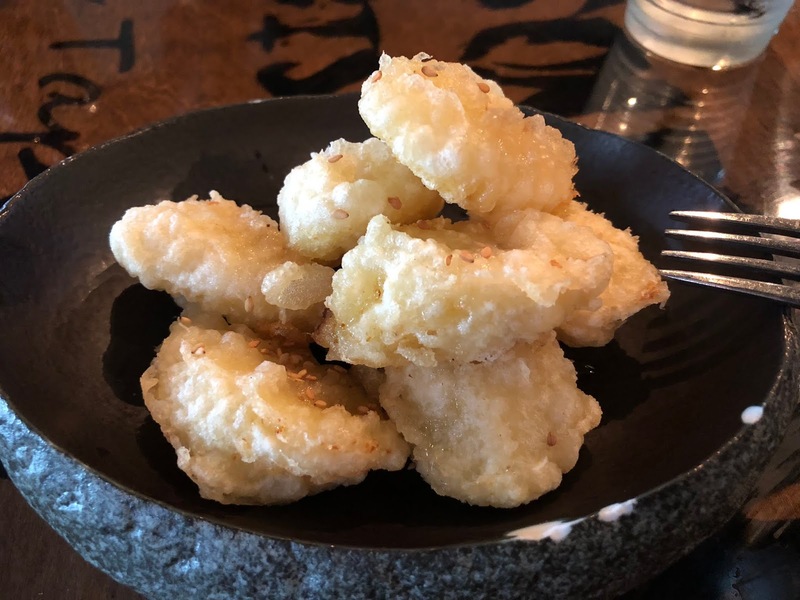 Because Hunan cuisine employs many spicy elements, Sumiao has increased the sweetness of its Mai Tai without adding the abundance of fruit juice that’s often found in a traditional Mai Tai. Complex flavors such as clove, cinnamon, citrus and molasses come with each sip as a result of the decadent Chairman’s Spiced Reserve Rum. WHEN: Available during normal operating hours throughout the month of September. smoked bluefish pate, grilled garlic bread bruschetta finished with Olio Taibi "Biancolilla"
homemade tube pasta, sun-dried tomato pesto, almonds, pecorino pepato siciliano D.O.P finished with Olio Taibi "Nocellara"
Malden is home to numerous interesting & tasty restaurants, including a significant number of ethnic spots, from Vietnamese to Haitian. It would take you plenty of time to explore all of them, meaning you might miss out on some of the best places. 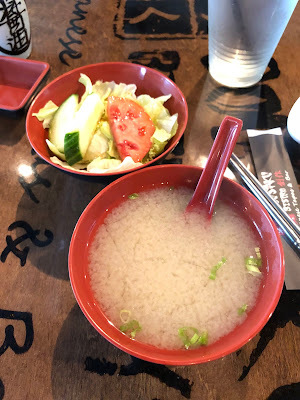 For example, though Sousaku Bistro, a Japanese restaurant, has been open since the end of 2015, it was only until recently that I dined there a couple times for lunch. Located at 166 Eastern Avenue, and set up a little from the road, it can be easy to drive by and miss this spot. And it isn't in an area that seems to get much foot traffic. Around the corner, on Ferry Street, you''ll find several other restaurants and most of the foot traffic is there. As such, Sousaku seems to fly under the radar and you need to intentionally seek it out. It is open six days a week, closed only on Tuesdays. 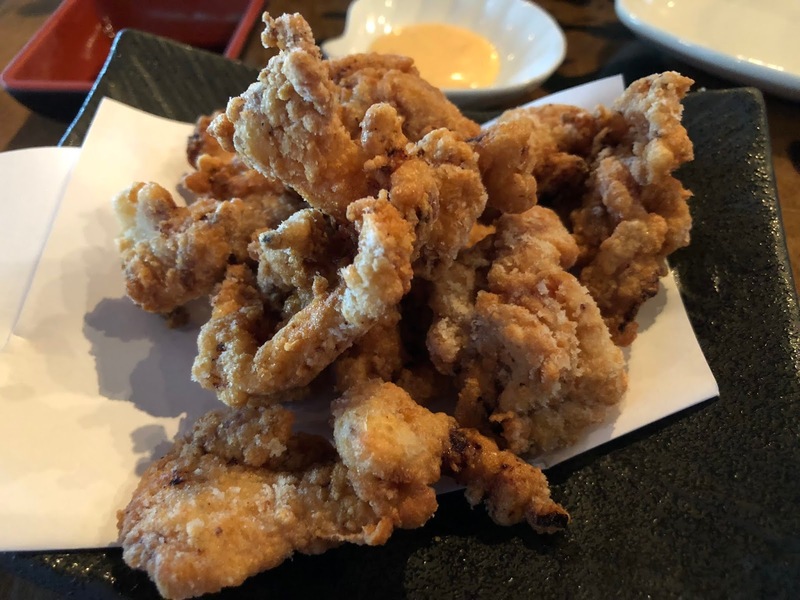 Sousaku has a quite large menu of Japanese cuisine, from Sushi to Yakitori, Kushikatsu to Rice Bowls, and so much more. Many of these are traditional dishes, but there are also plenty of more innovative dishes where the chef has created his own unique takes. Prices are generally reasonable considering the quality and quantity of the dishes. They have a fully stocked bar, including Sake (with several good options) and Japanese Whiskey. The Sushi Lunch ($12) includes 5 pieces of Nigiri Sushi and a Tuna Roll, accompanied with Miso Soup and Salad. The miso and salad were good, with a light and tasty dressing atop the salad. 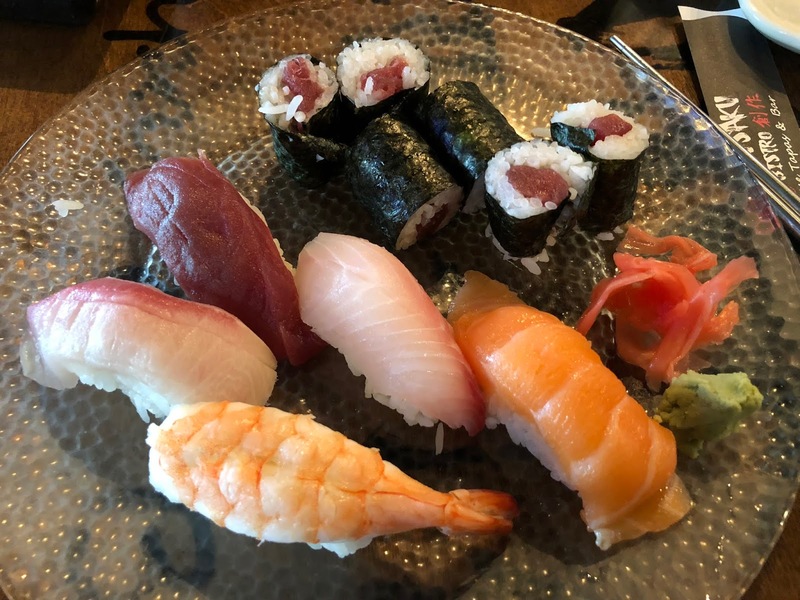 The Sushi was good-sized, tasted fresh and was very satisfying. Two pieces of Maguro are usually $7.50, meaning their Sushi is a bit more expensive than many other spots, but still less expensive than some high-end places. And based on the size and quality, the price is fair. This lunch special is a very good deal. The Sweet Potato Tempura (3 pieces for $2.95) was exquisite, just perfect crispy tempura batter covering the tender sweet potato. 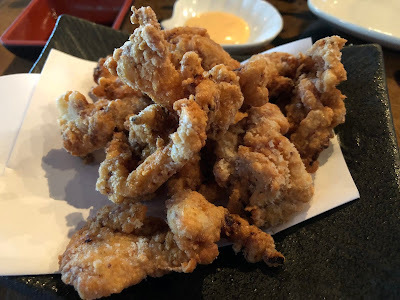 I often judge a Japanese restaurant by the quality of their tempura and in this regard, Sousaku is a big winner. I would probably order some tempura every time I dined here. 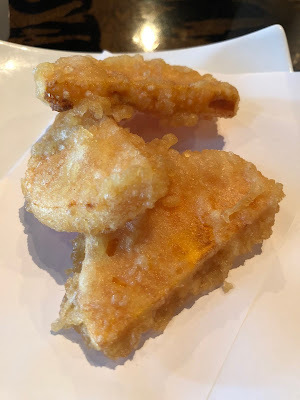 The Tatsuta-Age ($6) is deep fried marinated fried chicken in a light batter, and it was tender and moist with a nice taste to the flavor, with hints of possibly ginger. This has a much lighter batter than "chicken fingers" and it is more about the chicken than the batter. 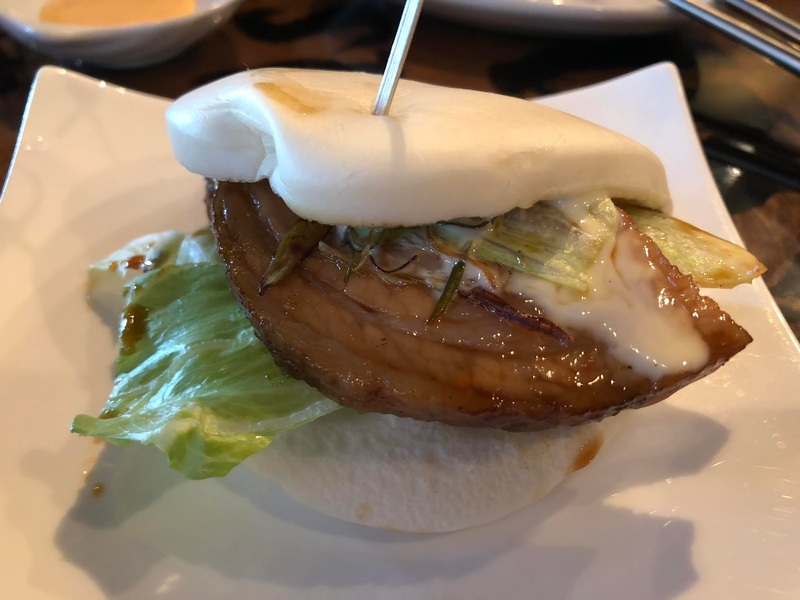 The Boky Bun ($6) is a roasted pork bun, served with lettuce, fried scallion & their special barbecue sauce. However, the menu doesn't mention there is also mayo on the bun, which was a fail for me. Otherwise, it was a delicious sandwich, with tender pork, a soft bun, and the fried scallions added a nice little crunch. 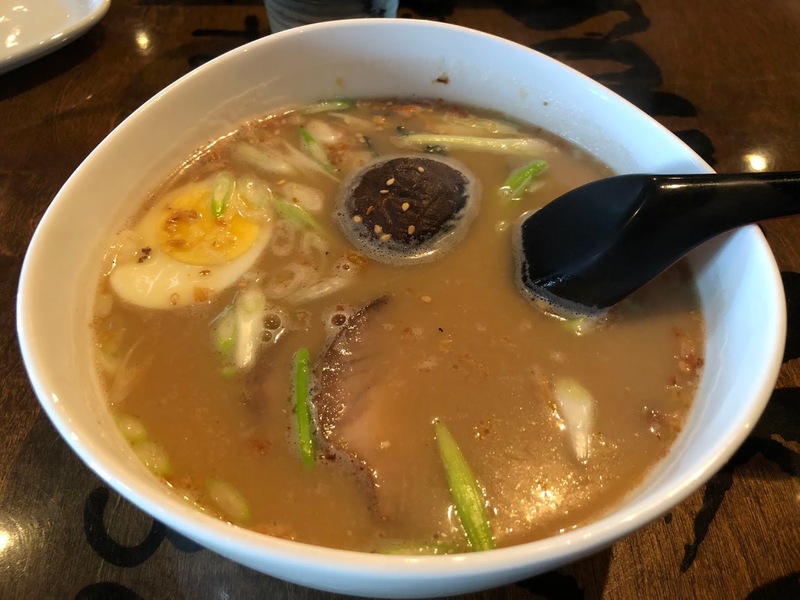 The Chashu Pork Noodle Soup ($9.25) is made with slices of roasted pork, shiitake mushroom, fried onion, scallion, corn, half-boiled egg, sesame, and wakame. You then have the choice of a Curry Broth or Tonkotsu Broth. You also have the option of Soba, Ramen or Udon noodles. I opted for the Tonkotsu with Ramen, and it was okay but nothing special. Presentation was lacking and it lacked the depth of flavor you find in better Ramen soups. The Yakitori menu has 12 options ($3-$10 per skewer), and you order by the individual skewer, though there is a Combo plate available. I tried the Matsusaka Pork, Oyster Mushroom Wrapped in Bacon, Scallop, and Chicken. 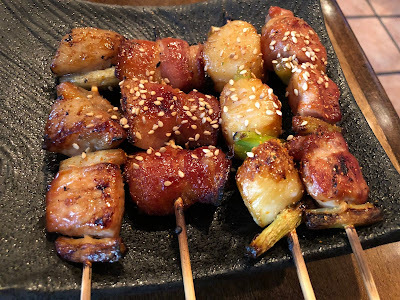 I liked the barbecue sauce on each grilled skewer, with the nuttiness of the sesame seeds, and the meats and seafood were cooked well, being moist, tender and flavorful. A nice variety of flavor and textures, and I would like to try more of the skewers. The Dessert Menu has 4 choices, such as Fried Ice Cream and Mochi, and I enjoyed the Fried Banana ($5). A nice, crispy light batter covered the sweet, slightly mushy banana pieces. Sousaku is worthy checking out, though maybe their menu is too large and they might be better off concentrating on less. Service was excellent on both of my visits. I will be returning there to check out more of their offerings and would like to hear from anyone else who has dined there. Servers, consider this hypothetical: You have been asked to serve a once-in-a-lifetime table of customers. How would your service differ in this experience over your usual service? Take some time to ponder your answer. Be honest with your answer. You aren't giving a public response so there is no need to put up a front. Now, if you answered that your service might be better, more extensive, more accommodating, more personable, or something similar, then maybe you need to change your mindset concerning service. Maybe you need to learn some Japanese. Ichigo ichie is a Japanese proverb that can be literally translated as “one time, one meeting,” or more loosely translated as "one chance in a lifetime" or "never again." The underlying meaning of the proverb is that you need to cherish every encounter in your life as if it will never be experienced again, as if it were a once-in-a-lifetime event. Even if you meet the same people at multiple encounters, each of those encounters is unique in its own way, and you never know if that meeting will be the last one. This proverb is a central component of Japanese hospitality, also known as Omotenashi. I'm not going to go into depth on the concept of omotenashi in this post, but will concentrate on ichigo ichie. Japanese servers cherish the moment with each guest, understanding this might be their only encounter with this person so they want to present their best face and give their best service. You give your all, for every guest, at all times. You don't adjust your service as to whether you feel someone is a big tipper or not. This is far from an easy concept to enact, especially considering what we are taught in our American culture. In addition, for this concept to best work, customers need to embrace it as well. They need to accept each restaurant visit as something unique, a once in a lifetime meal. There needs to be a mutual respect between customer and server. The customer needs to strive to be the best they can be as well. And it might be far easier to get servers to change than customers. How many customers are going to be open to lessons in how they can be a better customer? Let this be a starting point for further discussion. The Japanese certainly have fascinating thoughts on hospitality and maybe they can be adapted for the U.S. hospitality industry. Or maybe the U.S. isn't ready for such a change. Ponder this: Is Brunch just an excuse to have a cocktail for breakfast? 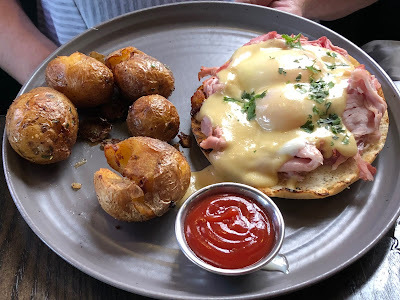 This past Sunday, I wanted to check out a Brunch and after perusing the interesting menu for Ledger Restaurant & Bar in Salem, I decided to dine there. 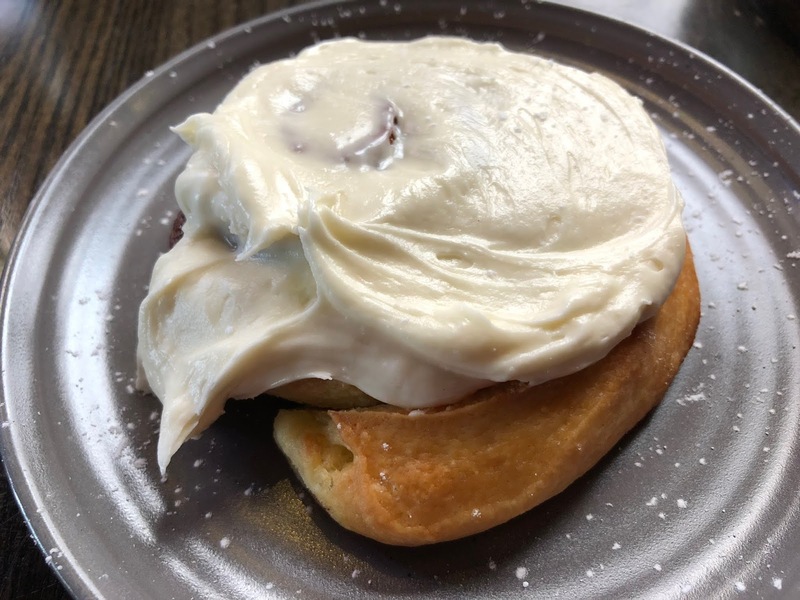 Ledger serves Brunch on both Saturday and Sunday, starting at 10am, and you can opt to sit on their patio or inside the spacious restaurant. It was fairly busy on Sunday, though we didn't need a reservation to be seated. Though I'd had some cocktails at Ledger when it first opened, I hadn't dined there yet. There are 6 cocktails on their Brunch menu, including a Mimosa, Paloma and Sangria. 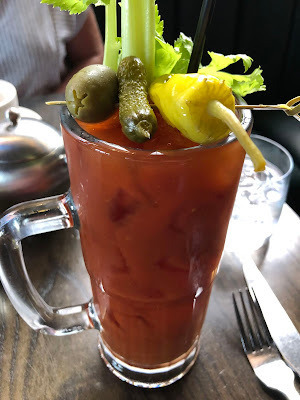 Most are priced at $9-$10 except for their 22 oz Bloody Mary ($14), which is pictured above, and garnished with celery, an olive, a gherkin, and a hot pepper. It was a well made drink, with a pleasant spiciness and some other intriguing spices that were hard to identify, but which helped to make this cocktail different from many other Bloody Marys. We began our meal with a couple Sides, which are priced from $4-$6. One of their Sides is their Daily Donut ($5), and its flavors vary week to week. Their two flavors this week didn't appeal to us so we opted for a couple others, including the Cinnamon Roll ($4), smeared with an ample portion of creamy, sweet frosting. The Roll itself was fresh, soft and flaky, with plenty of cinnamon. An excellent way to begin your Brunch. My only minor complaint is that they didn't need the light touch of powdered sugar. That is certainly a pet peeve of mine as I see no real reason for its necessity. And the Banana Bread ($4) also didn't need the powdered sugar either. 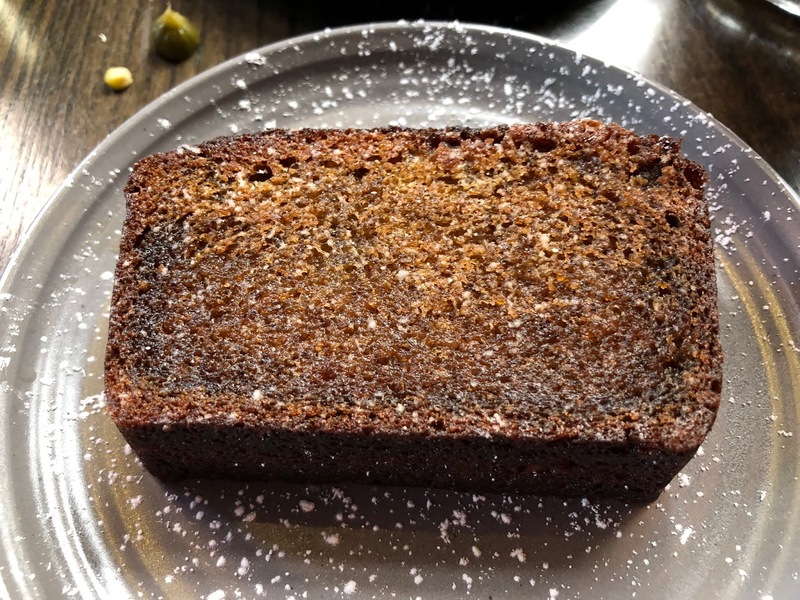 Slightly warm, the banana bread was moist and flavorful, with a rice banana taste. Another very good way to start your brunch, or end it, dependent on when you choose to have your sweet. The menu has 14 Entrees, priced at $10-$17 except for the Prime Skirt Steak & Eggs ($29). You'll find items such as the House-Cured Pastrami Hash ($15), Breakfast Burger ($17), Fried Chicken Thigh Sandwich ($12), and Maple Glazed Pork Belly ($14). I am also intrigued by the Banana Bread Foie-ster ($15) which consists of grilled banana bread, rum caramel sauce, seared bananas, & foie gras butter. I also ordered that but will likely do so on a future trip to Ledger. The Eggs Bendict ($14) has house-made Canadian bacon, soft poached eggs, & smoked hollandaise atop a megamuffin with a side of breakfast potatoes. The hollandaise sauce was done well, contributing to the excellent taste of this dish. The potatoes were also cooked just right, making this a hearty and delicious dish. 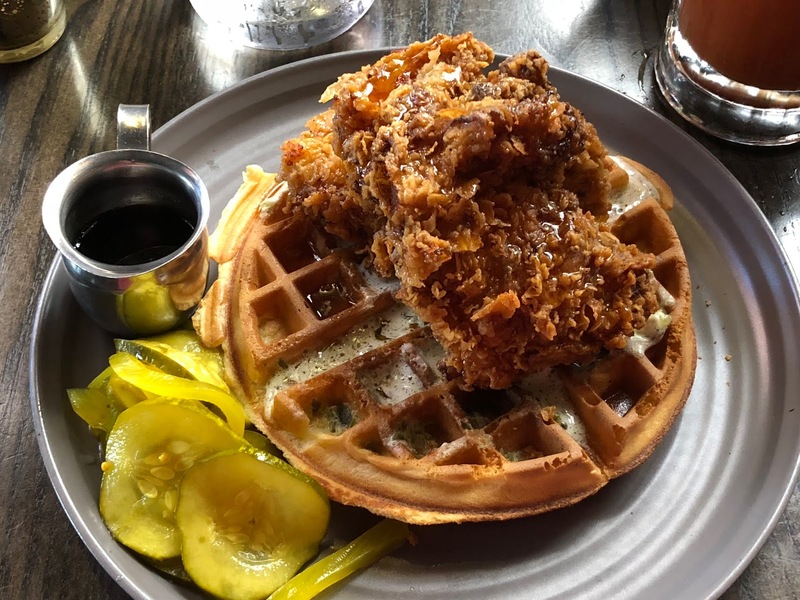 I opted for the Chicken & Waffles ($14), which included buttermilk fried chicken, a corn waffle, green chile butter, hot honey, and a side of pickles. The fried chicken was superb, with a great, crisp and clean coating, moist chicken with an added sweetness from the honey. The waffle too was very good, with only a mild corn flavor, enhanced by a subtle spice from the green chile butter. One of the best Chicken & Waffles dishes I've enjoyed in some time, and it is highly recommended. Service was excellent, and out server was pleasant, personable and accommodating. Prices were reasonable considering the quality and quantity of food. My first impression of the Ledger's cuisine was certainly very positive and I look forward to dining there again soon.